This device is similar to a plate-and-frame filter press but the whole plate assembly is also housed in a tank or pressure vessel. This design allows higher pressures to be used, and also allows the filtration operation to be done more efficiently in many applications. There are two basic configurations, namely a horizontal plate and a vertical pressure leaf filter. Horizontal plate pressure filters were commonly applied to the fine chemical process industries such as antibiotics , pesticides or pigments when the load of impure insolubles is low and polishing is required to obtain a high product clarity. In more recent years they may be seen more and more in heavier industries such as fertilizers or precious metals when the product is the cake and efficient washing and low moistures are required. These units are well suited for handling flammable, toxic and corrosive materials since they are autoclaved and designed for hazardous environments when high pressure and safe operation are required. Likewise, they may be readily jacketed for applications whenever hot or cold temperatures are to be preserved. 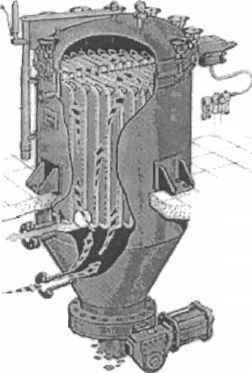 These features are not possible on filter presses which require the opening of plates to the atmosphere and shifting them one by one to allow cake discharge at the end of each cycle. When efficient washing is required. 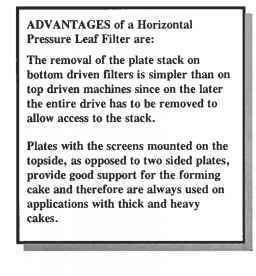 When the cake is heavy and must be supported as opposed to a Vertical Leaf Filter where the cake forms on a vertical surface and may fall-off once the pressure drops. 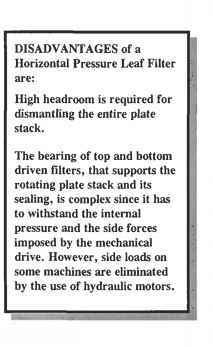 • The rotating disc stack. • The vibrating disc stack. • With a conical bottom and a central outlet. • With a dished bottom and a side outlet. Tanks with conical bottoms discharge cakes by gravity and those with dished bottoms have a spade that rakes and conveys the cake towards the outlet. Hence, the conical types require more headroom as compared to the dished type having the same filtration area. Conical tanks also have often an additional scavenging plate at the lower part of the cone to filter the residual slurry heel that remains below the main plates. The slurry heel that remains at the very bottom of the tank is removed through a special dip pipe to avoid discharging a wet cake. To facilitate better cake discharge there are designs with sloping plates. With this concept the cake, owing to the centrifugal force, flies off the plate in a horizontal trajectory without being dragged and subjected to the frictional radial shear over the surface as with conventional flat plates. The cake that accumulates on the plates may be discharged as a wet thickened sludge or as a dry cake. For wet cakes the vessel will normally have a small outlet that is fitted with a valve whilst for dry cakes the opening is large and the closure locks up electrically or hydraulically with a bayonet wedge. Step 1. Precoating - The precoating stage is done only in the following cases: (a) When the contaminants are gelatinous and sticky it forms a barrier that avoids cloth blinding. Likewise the interface between the precoat and the cloth departs readily so the cake discharges leaving a clean cloth; (b) When a clear filtrate is required immediately after the filtration cycle commences otherwise recirculation must be employed until a clear filtrate is obtained. Step 2. Filtration - Once the precoating stage is completed the process slurry is pumped into the filter, the forming cake is retained on the plates and the filtrate flows to further processing. When the solids are fine and slow to filter a body-aid is added to the feed slurry in order to enhance cake permeability. However, it should be kept in mind that the addition of body-aid increases the solids concentration in the feed so it occupies additional volume between the plates and increases the amount of cake for disposal. Likewise, for all those applications when the cake is the product, precoat and filter-aid may not be used since they mix and discharge together with the cake. Step 3. Heel Removal - Once the filtration cycle is completed it is necessary to remove the slurry heel that surrounds the plates. This is done by blowing air into the tank which displaces the slurry down to the lowest plate and further to the scavenger plate if one exists. The remaining slurry at the very bottom is recirculated through a dip pipe back to the feed tank until the entire slurry has been evacuated. Step 4. Cake Drying - The air then continues to pass through the cake until the captive moisture is reduced to a minimum and the cake is in practical terms considered to be dry. Step 5. Cake Discharge - At this point the air pressure is released, the cake outlet is opened and the plate stack is rotated to discharge the cake. The cake outlet opening must be interlocked with the motor drive since its spinning is conditional to the outlet being open. On some filters the cloth or mesh screen may backwashed with water after cake discharge to dislodge and remove any cake residue that adhered to the medium. The horizontal plate filter requires attention on a regular basis to safety devices and automation features that accompany modern filters. The space above the filter should have a hoisting device and sufficient headroom to lift the entire disc stack and move it horizontally to a location adjacent to the filter tank. It is recommended to have a special rig that will hold the plate stack for maintenance since the bigger ones may reach a length 3 meters or more. Space must also be allocated for the cover which may be either if it is hinged or removed. Vertical Pressure Leaf Filters are essentially the same as Horizontal Plate Filters except for the orientation of the filter elements which are vertical rather than horizontal. They are applied for the polishing slurries with very low solids content of 1-5% or for cake filtration with a solids concentration of 20-25%. As with the horizontal plate filter the vertical leaf filters are also well suited for handling flammable, toxic and corrosive materials since they are autoclaved and designed for hazardous environments when high pressure and safe operation are required. Likewise, they may be readily jacketed for applications whenever hot or cold temperatures are to be preserved.The largest leaf filters in horizontal vessels have a filtration area of 300 m2 and vertical vessels 100 m2 both designed for an operating pressure of 6 bar. vary from 30-100 mm depending on the cake formation properties and the ability of the vacuum to hold a thick and heavy cake to the vertical leaf surface. The two types of vessel geometries employed are vertical and horizontal. In most of the fine chemicals processes the leaves are fitted into vertical vessels whereas horizontal vessels are used in the heavier process industries such as the preparation of sulfur in phosphoric acid plants. The leaves inside horizontal tanks may be positioned either along the tank axis or perpendicular to the axis. In order to utilize the tank volume for maximum filtration area the width of the leaves is graduated so they fit to the circular contour of the tank. This also reduces the slurry heel volume that surrounds the leaves. The vessels are fitted with highly secured cake discharge openings to ensure safe sealing of the tank under pressure. Minimum floor space for large filtration areas is required. Liquids are volatile and may not be subjected to vacuum. There is a risk of environmental hazard from toxic, flammable or volatile cakes specially secured discharge mechanisms may be incorporated. High filtrate clarity is required for polishing applications. Handling saturated brines that require elevated temperatures the tank may be steam jacketed. The cake may be discharged either dry or as a thickened slurry. this will impair cake discharge. There are instances when the cake is disposed to ponds or repulped for further treatment. In these situations special oscillating high impact jet headers sweep the medium surface and sluice the cake through the discharge outlet. These headers also serve to wash the filtering medium and dislodge particles that clog the metal screen or cloth. Figure 10. Vertical leaf filter machine. Step 1. Precoating - The precoating stage is done only in the following cases: (a) When the contaminants are gelatinous and sticky the precoat layer forms a barrier that avoids cloth blinding. Likewise the interface between the precoat and the cloth departs readily so the cake discharges leaving a clean cloth; (b) When a clear filtrate is required immediately after the filtration cycle commences otherwise recirculation must be employed until a clear filtrate is obtained. Step 2. Filtration - Once the precoating stage is completed the process slurry is pumped into the filter, the forming cake is retained on the leaves and the filtrate flows to further processing. When the solids are fine and slow to filter a body-aid is added to the feed slurry in order to enhance cake permeability. However, it should be kept in mind that the addition of body-aid increases the solids concentration in the feed so it occupies additional volume between the leaves and increases the amount of cake for disposal. Likewise, for all those applications when the cake is the product, precoat and filter-aid may not be used since they mix and discharge together with the cake. Step 3. Heel Removal - Once the filtration cycle is completed it is necessary to remove the slurry heel that surrounds the leaves otherwise the cake will be wet while being discharged. For this purpose a special dip pipe at the very bottom of the tank evacuates the remaining slurry heel which is recirculated back to the feed tank. Step 5. Cake Discharge - At this point the air pressure is released, the cake outlet is opened and the leaf stack is vibrated to discharge the cake. The cake outlet opening must be interlocked with a pressure sensor to avoid opening under pressure. On some filters the cloth or mesh screen may be backwashed with water after cake discharge to dislodge and remove any cake residue that adhered to the medium. The maintenance requirements on these machines is labor intensive and mirrors those of its horizontal counterpart. This family of filters consist of a vertical pressure vessel with a horizontal filter plate at the bottom. The filtrate from this equipment flows out a nozzle on the bottom of the filter. These devises are usually used for slurries where large amounts of solids are being collected. Variations of this equipment include equipment with removable lower heads for easy cake removal, ability to pressure or vacuum filter, ability to wash the filter cake, an agitator to break-up and rewash the filter cake, and heating or cooling jackets for the whole vessel. 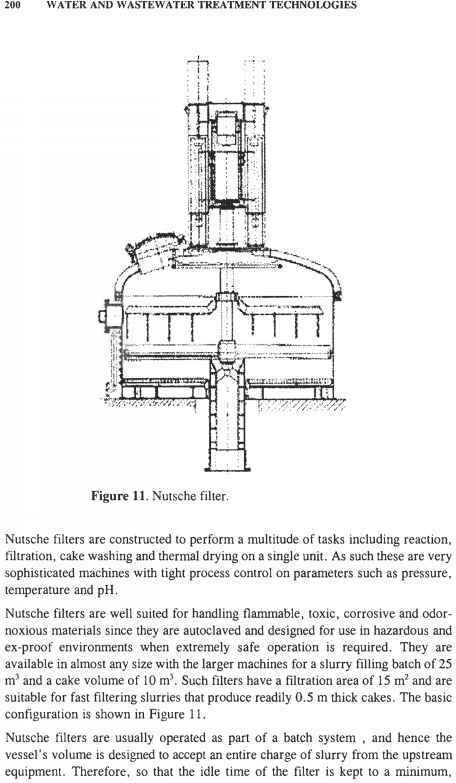 The Nutsche filter is the industrial version of the well known laboratory scale Buchner Funnel with the exception that it is designed to operate under either on vacuum or pressure. sufficient holding volume is required for fast charging and emptying of the vessel . The vessels are generally designed for an operating pressure of 2-3 bars but higher pressures may be specified if required. The vessel's cover supports the hydraulic system that controls the raising and lowering of the rotating auger and paddle arms as well as the various flanged connections and maintenance manhole. With larger units the dished head cover is bolted on its top. With this arrangement it is necessary to enter the vessel for the replacement of the filter medium. On smaller filters the head and cylinder are in one part that bolts to the filter floor featuring easy access to the filter medium. This arrangement has usually swing type fast locking bolts which are attached to the circumference of the filter floor. For applications that require preservation of temperature the vessel may be double-walled or half-pipe jacketed to provide effective heat transfer to the product. The filter floor consists of a densely perforated plate sufficiently strong to hold the cake weight and the pressure that is exerted on the cake's surface. On the larger filters additional support to the plate is given by ribs between the vessel's floor and the filter plate. There are three types of filter medium that cover the filter plate: woven metallic mesh screen, synthetic filter cloth, and sintered metallic plate. Selection depends entirely on the characteristics of the solids, the liquid and the appropriate materials of construction. Medium selection cannot be determined on a bench scale leaf test and it is only pilot testing that can establish long term effects such as medium blinding and fluctuations in the feed properties. The unique design feature of this machine is the rake arms which are used for cake washing, smoothing and discharge of the cake. These tasks are done by paddle or paddle and auger systems: The paddle system consists of two arms with slanted blades that rotate in one direction to re-slurry the cake during washing and discharge it at end of cycle. The paddle arms are rotated in the opposite direction for cake smoothing to seal cracks prior to cake drying. In this system one hydraulic arrangement raises and lowers the paddles depending on the filtration cycle. 1. Filtration - The filter is charged with slurry and pressure is applied to displace the filtrate leaving the cake retained over the filter medium. For slurries with a wide distribution of coarse fast settling solids and slow settling fines there is a risk of segregation with the finer fraction settling over the coarse fraction. When this happens the fines seal the cake and slow down the cake formation so keeping the slurry in suspension with rotating arms during filtration assists in forming a homogeneous cake. 2. Cake Washing - In the washing stage a spray ring or connections on top of the cover introduce the wash liquid over the cake. This displaces the mother solution with the wash liquid but with such in-situ washing the efficiency may be quite low if the cake forms with an uneven thickness. One of the advantages of the Nutsche Filter is the ability to smoothen the cake's surface prior to applying spray wash so that the entire bed is washed evenly. 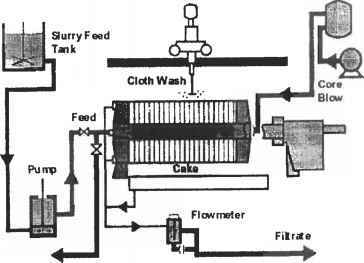 Washing efficiency may be further improved if air or gas are not allowed to enter the cake in a multi-washing system so the wash liquids always displace the solutions in a "piston" like manner. This is achieved by a special detector that monitors the surface of the cake for moisture and once air or gas start entering the bed a signal is transmitted to close the filtrate valve and reopen it once next washing commences. 3. Cake Repulping - Many processes require high washing efficiency to remove the contaminating liquid from the product and washing the cake by repulping yields the most efficient product purity. This is done by resuspending the cake with the paddle arms for thorough mixing with the wash solution. During resuspension the rotating arms are moving slowly downwards and are "shaving" the bed gradually layer after layer until the entire cake enters the slurry. 4. Pressure Drying - In the drying stage air or gas purges the cake until the captive moisture is reduced to an asymptotic level and in practical terms the cake is considered to be as dry as possible. To obtain minimum moisture the cake is smoothened by reversing the rotation of the paddle or auger arms and exerting controlled pressure on its surface with the hydraulic system. This seals cracks in the cake so that air or gas will not bypass the bed. 5. Vacuum Drying - Further reduction in cake moisture may be obtained by slowly rotating and lowering the paddle arms to scrape and delump the cake. To take advantage of the drying ability of the Nutsche Filter it is worth considering the option of heating components such as the vessel, filter floor and paddles to enhance drying. 6. Cake Discharge - Once all the stages are completed the cake discharge valve opens and the paddle arms on the smaller machines or the auger arms on the larger ones are rotated and lowered to convey the dry cake towards the center. The same procedure also applies to side discharge machines however it should be noted that in this case the cake comes out intermittently and not continuously. 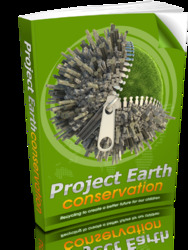 This may have a layout impact on the downstream facility such as the conveyor that handles the product to storage. These filters are similar in configuration to a Nutsche filter, but instead of one filter plate there is a series of plates inside the vessel. The filtrate is pulled through the filter media in the center of each plate to a central pipe that discharges out the bottom of the devise. The bottom plate of the filter usually discharges its filtrate thought a separate nozzle. These filters are usually used with slurries where a smaller quantity of solids is to be collected. O Handling saturated brines or process conditions require elevated temperatures the vessel, filter floor and paddles may be heated O Res lurry washing, being more efficient than in-situ displacement washing, is required. O Sharp separation between the mother and wash solutions is required O The cake tends to crack smoothing avoids the wash liquid, air or gas purge from by- passing. handling flammable, toxic and corrosive materials since they are autoclaved and designed for hazardous environments when high pressure and safe operation are required. Likewise, they may be readily jacketed for applications whenever hot or cold temperatures are to be preserved. The filter structure consists of a stack of plates attached to a hollow shaft which are mounted inside a pressure vessel with each plate covered with a suitable filter medium. The slurry is fed under pressure into the vessel and the cake, which is retained by the filter medium, forms on the top of each plate whilst the filtrate passes through the hollow shaft further to the process. Filter sizes may vary but generally the maximum is 60 m2 area and designed for a 6 bar operating pressure. Each circular plate in the stack is constructed with radial ribs that are welded to the bottom and support a horizontal coarse mesh screen which is covered with a finer woven metal screen or filter cloth to retain the cake. The bottom of the plate slopes towards the hollow central shaft which lets the filtrate flow freely through circumferential holes and further down the shaft to the filtrate outlet. The clearance between the plates is maintained by special spacers with "o" rings to positively seal between the slurry that surrounds the plates and the shaft that collects the filtrate. The height of the spacers determine the clearance for cake build-up and may be replaced to meet various process conditions. One of the differences between polishing and cake filtration is the space between the plates. For polishing applications the clearances are about 20 mm as opposed to cake filtration applications where, depending on the percentage of solids and cake build-up properties, clearances may reach 100 mm. Hence, polishing filters accommodate more plates than cake filters so for the same vessel size more effective area is available with polishers. How to keep cake from dropping off of leaf filter?